Charlie Adam, Ian Sands and Martin Kennedy. Ian Sands from Balbeggie in Perthshire pledged that if elected, he would do more to promote a thriving, profitable and forward-thinking industry. “Brexit has the potential to affect not just us but generations to come. 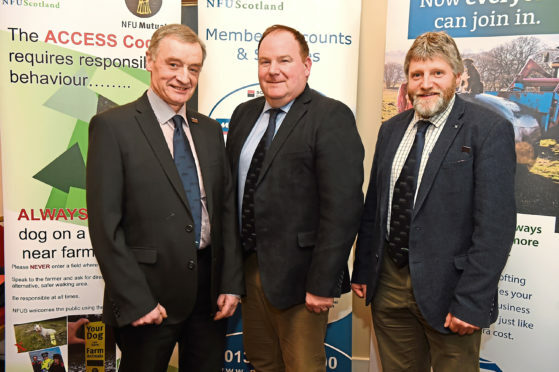 This cannot be seen as the end but as the beginning because no matter what, change is coming – and the NFUS will have a massive job to influence Westminster and Holyrood governments to support Scottish agriculture for the benefit of the nation,” he said. Mr Sands also pointed out the challenges which the upland livestock sector is facing with cuts to Less Favoured Areas Support Scheme (LFASS) funding. Sitting vice-president Martin Kennedy, from Aberfeldy, also weighed in on the fiasco surrounding LFASS payments and the future of funding. He said: “Half a billion pounds of the money coming into Scotland is money very well spent, but it could be spent better. We now have an opportunity to devise a support policy that awards those that are doing the work and taking the risk rather than simply paying out on the occupation of land. Alford farmer Charlie Adam said the union must make efficient use of all its people and its resources. He said: “We often hear that members don’t know enough about what we are doing, or we don’t communicate well enough. Members need to get regular information from us, and they need to know they’re being listened to. Two vice-presidents will be elected next month.